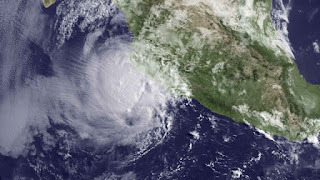 The recognized hurricane season for the Eastern Pacific, including the coast of Mexico, officially started on May 15th. Instead of anchored in some protected cove in the Sea of Cortez, hundreds of miles to the north, we're still here in Barra waiting on engine work as the season gets off to an unusually early start with Tropical Storm Aletta last week and Hurricane Bud this week. Life here in Barra seems to get more interesting every day. Hurricane Bud made landfall on Friday just a few miles north of here. Fortunately, it had weakened to a Tropical Storm by the time it hit us. A few days before it peaked at Category 3 strength, with 115 mile-per-hour winds, making it the earliest Category 3 hurricane on record in the Eastern Pacific. Hurricanes are uncommon in the Eastern Pacific in May; there have been just twelve since record keeping began in 1949. Apparently, no one told Bud. For the few cruisers keeping their boats here, the pucker factor increased with the predicted wind speed as we all watched the forecasts for Bud making a beeline for Barra. In anticipation, we moved the boat to a more protected dock. Extra dock lines were set, fenders tied, sails bagged, and canvas removed as we prepared for the worse. Fortunately, the marina is well protected. A hurricane came through here last season without causing any serious damage ̶ an outcome that provided some comfort as we all hunkered down. We awoke Friday morning to rain showers and increasing wind. By the time we finished breakfast it was dumping hard and blowing 25 knots. From the previous days forecast, I expected it to get a lot worse later in the day. There was a high probability of sustained 50-knot winds. The idea of scrambling on deck to reset chafe gear or secure loose lines with a nervous wife and toddler down below was a little, let's say, unsettling. Millie and I talked about moving to the hotel if it got really bad, but the idea of getting the baby off the boat and to the hotel in 50-knot winds was also a little unsettling. So, when we saw 30-knots and a break in the rain we decided it was time. Millie and Colin could get a room overlooking the marina and I could stay and focus on the boat without any distractions. We didn't realize it at the time, but the storm was already passing as we checked in to the hotel. It weakened significantly before skirting the coast just north of here. By afternoon the lagoon was flat and the marina calm. The 30 knots we saw was the peak. Millie and I stood on the balcony of our luxurious accommodations overlooking the marina with dumbfounded expressions. Where the hell is all the wind? It must be a lull before the big hit, we reasoned. But no, the big hit never came. That was all. We felt a surprising and unexplained sense of disappointment. All the worry and preparation and that was it? Soon, however, our dismay turned to relief as we realized how fortunate we were. And, even though the hotel turned out to be a large waste of money, it did provide a great opportunity to get off the boat and spoil ourselves for a night. We thought we deserved it, given the situation and certainly made the most of it. An air-conditioned room, a warm bath, a king-sized bed, TV, and complimentary breakfast ̶ thanks, Bud.